So you’ve made it this far to travel to Uruguay, or at least look at this page to consider such a trip. As with any destination there are pieces of advice that can help the time you spend in this nestled away little South American locale be the best that it can be. More tips and suggestions are. Well this is South America so it is a given that there is going to be some good coffee around. Were not saying to forgo your morning cup of java, but in Uruguay there is also another hot drink on offer that you should try. Mate is a super strong green tea. People routinely carry around thermos of hot water so that they can routinely throughout the day make themselves cups of mate. Sharing mate, even amongst strangers, is a social tradition in Uruguay and a way for you to get connected with the local traditions. If mountain trekking is what you are looking for Uruguay is not going to be the place for you. The country does not have any mountains and the highest elevation is 500 meters. With that said options for great coast line and beaches is vast. With laws forbidding development on beaches there are many unobstructed, pristine beaches around to be chosen from. Within 50 kilometres of the capital Montevideo options for beaches are abundant, with some of them having interesting little beach towns nearby. 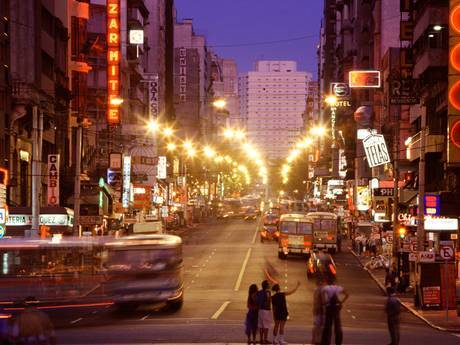 Around the tourist sections of Montevideo are planchas, a community of street kids, you should avoid giving them money. The reason is that many of them are hooked on drug called pasta base which is an impure cocaine sulfate that is highly addictive. A sign of addiction is rotting teeth for kids very young for that. If you feel that you want to help these kids giving food is a better bet as money may just be used to buy pasta base. Regardless of your altruistic slant avoid talking to these kids at night time. For what ever reason, Uruguay has a lot of its pop culture still coming from a decade or two back. You’re just as likely to hear a Billy Ocean pop song as the newest Justin Timberlake track. The suggestion is don’t fight it and just go with it; people pay to have retro night, here you’ll be getting one without any hipster slant as par for the course.